Released theatrically in 2004, Jim Jarmusch's Coffee and Cigarettes is a collection of 11 low-key vignettes, shot in black-and-white, that each feature two or three characters sitting around a secluded table, consuming and often discussing the title stimulants. The cast is eclectic and includes some Jarmusch alums, like Roberto Benigni, Bill Murray, The RZA, Steve Buscemi, Tom Waits, Isaach de Bankolé, Joe Rigano, Vinny Vella, and Joie & Cinqué Lee (Spike's siblings), plus some other notable folks like Iggy Pop, Cate Blanchett, The White Stripes, The GZA, Steven Wright, Alfred Molina, Steve Coogan, and New York art scene staples Bill Rice and Taylor Mead. This odd and fairly famous line-up of actors got the film some attention, especially thanks to the iconically strange grouping of Murray and the two guys from the Wu-Tang Clan, but general consensus on the film seems to be that it's an interesting but unambitious doodle by a filmmaker who can do better. On the other hand, I've always enjoyed this film, ever since I first saw it in theaters twelve years ago*. I find that it works even better now -- divorced from the initial (indie-sized) wave of hype and from nervous arthouse crowds overeager to find laughs or meaning. Many critics sum up the film as a series of comedy sketches, but it's more like a wry chamber piece that starts with a few themes and then plays out a handful of variations. Jarmusch makes this intention clear in the way he reprises and reimagines the black-and-white checkerboard design established in the first segment (which, like the following two pieces, was originally a stand-alone short film), and again in the way each segment has its own signature piece of source music, and of course in the way that lines of dialogue -- and a few performers -- reappear in new contexts (Cinqué Lee is shown early on as a diner customer and appears later in The White Stripes segment as a diner employee; The White Stripes' scene also features the return appearance of fellow Detroit rocker Iggy Pop, at least on the soundtrack). Deadpan absurdity floats throughout the film, but the opening segment, in which Roberto Benigni and Steven Wright's jittery conversation climaxes with Benigni going to the dentist on Wright's behalf, is the silliest and most random part of the film. After that, Jarmusch takes the fundamental idea of people connecting over a cup of java and a smoke and then shows different people fail to do that very thing in numerous ways. Whether it's Steve Buscemi's server failing to get customers Joie & Cinqué Lee to come around to his point-of-view on Elvis Presley, or Cate Blanchett failing to reconcile with her literal poor relation (also played by Blanchett, in a long dark wig), or Renée French fending off the awkward small talk of a smitten waiter (in admittedly the weakest scene in the bunch), Jarmusch shows what happens when mismatched characters meet up for a chat: they more often use the coffee and cigarettes as a deflection rather than common ground upon which to come together. The finest example of this is the segment called "Cousins?," with British actors Alfred Molina and Steve Coogan. It's the longest sequence in the film (roughly 17 minutes), but it's also the most satisfyingly nuanced and the best acted (sorry, Ms. Blanchett). Nice-guy Molina has some news to share with the self-involved Coogan, but since they don't know each other, except by résumé, Coogan keeps Molina at arm's length. Their polite conversation (over English tea and biscuits, naturally) turns quietly hostile, as Coogan steadily builds a wall against Molina's entreaties for friendship. Coogan's ego eventually forces him to eat his words, in a cringeworthy comeuppance beautifully tailored to the man who brought the world Alan Partridge. Jarmusch does a great job sculpting his scenes around the way he views the actors in them. In the Iggy Pop-Tom Waits scene, Pop is fundamentally a sweetheart and Waits is a mischievous curmudgeon. 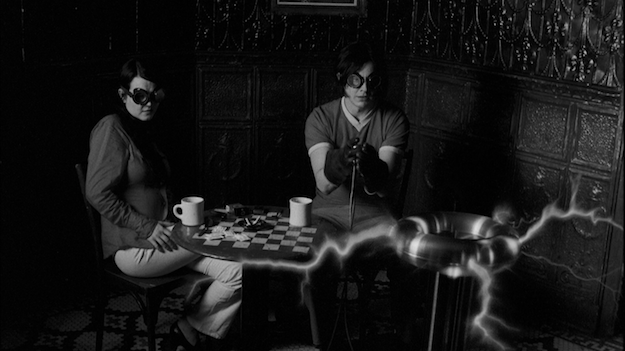 In the White Stripes scene, Jack White is the half-cocked visionary who needs the advice and guidance of his secret weapon, Meg White, to better execute his schemes. In the elegiac closing scene, former underground art stars Taylor Mead and Bill Rice -- both of whom have passed away in the intervening twelve years since the film's release -- argue about whether reality should be glamorous (Mead) or earthy (Rice). Naturally, some of the segments play like writing and acting exercises (the scene with Isaach de Bankolé and Alex Descas has a distinct "Subtext for Beginners" vibe about it), but despite what the skeptics say, the whole is arguably greater than the sum of its parts. And the film has only gotten better with age. *Actually, I know I saw the Steven Wright-Roberto Benigni segment years before -- I'm assuming in a cable rerun of the 1986 Saturday Night Live episode where it originated -- but let's not split hairs, okay? The older vignettes in the film were shot on 16mm film and Super 16, while the newer segments were shot on 35mm, which means this AVC-encoded 1080p 1.78:1 presentation sometimes sports chunky bits of film grain and sometimes has a better resolved, relatively slicker look. I actually remember seeing this on a film print in the movie theater and thinking it had a distinctly noisy "digital intermediate" look to it, so I would not be surprised if this transfer is just sourced from the original digital output from 2004. No complaints if it is, because this time around I didn't notice any heinous digital compression. Instead, there's a nice range of grayscale, with rich black levels and solid contrast. A solid upgrade. Typically, it seems like overkill to give a talky indie movie a DTS-HD MA 5.1 surround audio mix, but Jarmusch and his sound designers do an excellent job of evoking distinctly different spaces, through ambience and source music, in each vignette. A really solid and thoughtfully constructed sonic compliment. The disc offers English subtitles, which is all well and good, except that the sequence with Isaach de Bankolé and Alex Descas is spoken in a mixture of French and English and, unlike in the cinema, there are no forced subtitles when they are speaking French. This means you basically have to ride the subtitle button during the scene (or just leave the subs on, even for the English dialogue). Interview with Taylor Mead (HD upscale, 4:10) - A brief but highly entertaining junket interview, where Mead discusses his reactions to the film, and his reactions to the reactions to the film. Trailer - looks and sounds good in HD. 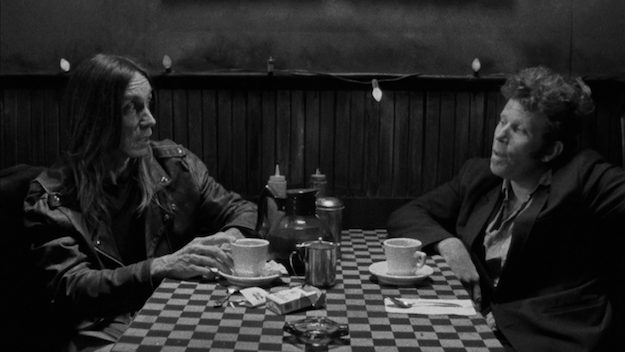 Frequently funny (and sometimes dull), Coffee and Cigarettes is more than a "minor film" in director Jim Jarmusch's career, as it is typically characterized. Instead, the film offers Jarmusch an opportunity to poignantly illustrate how people often use conversation to miscommunicate and disconnect, instead of the opposite. I knew I liked this movie, but I was genuinely surprised by how much more I liked it during this revisit. Highly Recommended.